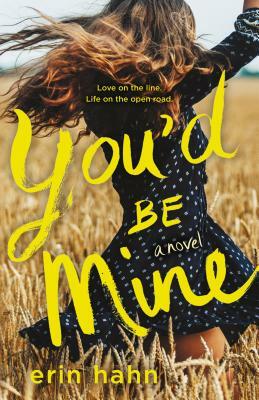 You'd Be Mine: A Novel (Hardcover) | Fountain Bookstore, Inc. Reads like a sun drenched, whiskey soaked country love song. Both Clay and Annie have back stories that will add tears to your beers, but their romance has a sweetness that keeps it in the Young Adult genre even if it's knocking on the New Adult door. I don't even like country music all that much, but this book had me looking up Country Music for Beginners Playlists on Reddit and talking with a lot more twang than usual. Recommend reading this in the cool shade of a willow tree while sipping a glass of sweet tea. ERIN HAHN started writing her own books when her little sister gave her shade about a country music-themed Twilight fanfic. By day, she likes to help kindergarteners make snakes out of playdoh. By night, she writes swoons. She married her own YA love interest who she met on her first day of college and has two kids who are much, much cooler than she ever was at their age. She lives in Ann Arbor, Michigan, aka the greenest place on earth and has a cat, Gus, who plays fetch. You'd Be Mine is her first novel. BUSTLE, "11 Upcoming Romantic YA Novels That Might Just Be Your New Favorite Rom-Com"
COSMOPOLITAN.COM, "15 Books Coming Out in 2019 to Bring to Your Book Club"
INSIDER, "20 new books coming out in 2019 you'll want to read"
SCHOOL LIBRARY JOURNAL, "Love Is In The Air: YA Romances To Look Forward to This Spring"
SHE READS, "Most Anticipated Romance Books of 2019"
BOOKBUB, "Most Anticipated Book Club Books of Spring!" THE NERD DAILY, "April Book Releases: YA"